Kotobukiya continues their line of ARTFX J Statues based on characters from Black Butler Book of Circus with a new Grim Reaper, Undertaker ! Undertaker and his iconic silver Death Scythe. Undertaker is a Grim Reaper, who works as an informant to the Phantomhive family. He maintains a facade as a funeral director within the normal society. ・Undertaker looks great in this 1/8 scale sculpt by Koei Matsumoto. ・With his flowing black clothing and grey hair, Undertaker looks as if he's stepped straight out from the story, directly into your collection ! 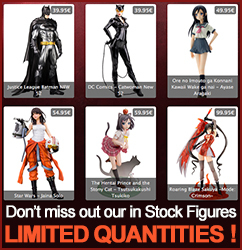 Display along with other ARTFX J Statues from Kotobukiya such as Grelle Sutcliffe or Ciel Phantomhive !